Bad news for smokers and good news for non-smokers – lighting up at mamak and hawker stalls may be illegal come December this year. The Health Ministry is pushing for open-air restaurants to be gazetted as non-smoking areas by the end of the year. The Ministry is also seeking to shut down the smoking room in the Parliament building in October, if there are no objections. 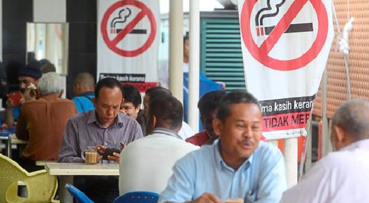 Deputy Health Minister Dr Lee Boon Chye announced the Ministry's intention to gazette al fresco restaurants as no-smoking zones under the Control of Tobacco Product (Amendment) Regulations 2017 at the Dewan Negara on Wednesday (Sept 5). Product Act is to protect the public, especially non-smokers, from the dangers of second-hand smoke," Dr Lee said. "This gazettement is Malaysia's commitment as a member state to the Framework Convention on Tobacco Control and adheres to the guidelines under Article 8 of the World Health Organisation (WHO)," he added. When contacted, Dr Lee told The Star that the Ministry had received positive feedback over the proposal. "During our engagement with industrial peers, coffee shop and restaurant owners, there were some reservations, but the general public is open and accepting of the plan," he said. The Gopeng MP said the gazettement was not only to encourage smokers to kick the habit, but also to protect others from second-hand smoke. "Smokers will say they have the right to smoke, but non-smokers also have the right to smoke-free areas," he said. Dr Lee said he hoped his fellow MPs would take the opportunity to quit smoking when they shut down the smoking room in Parliament. He added that there would be enforcement after the law comes into effect. The current regulations under the Control of Tobacco Product (Amendment) Regulations 2017 prohibits smoking in parks, hospitals, clinics, lifts, government premises, schools and public toilets.